NBC 5 and the Heard Natural Science Museum & Wildlife Sanctuary invite you to experience Halloween at the Heard, Collin County’s premier family-friendly event at the Heard Natural Science Museum & Wildlife Sanctuary on Saturday, October. 20, from 6 p.m. to 10 p.m.
Halloween at the Heard features a safe environment to experience the joy of trick-or-treating along the eerie Dinosaurs Live! 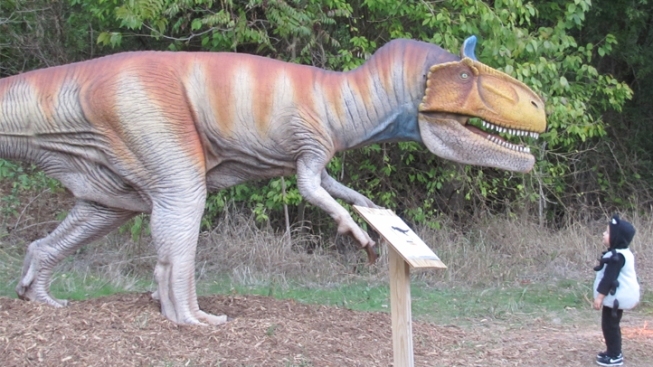 Live-Size Animatronic Dinosaurs trail. Families will enjoy an evening full of fun activities including a presentation of a family-friendly movie on the Heard's outdoor amphitheater stage. Kids ages 12 and under will also have the opportunity to participate in a costume contest. Those who dare will be able take a trail detour after the movie through the "Haunted Forest" and “Ghost Town” where they may encounter a ghost or creature of the night. Guests can also have a photo taken in their costumes. The Heard recommends that guests bring insect repellant, flashlights, water-resistant blankets and/or stadium seats for use during the movie. Concessions will be available for purchase. Tickets will be available to the public beginning October 3. Tickets for this annual event sold out over a week before the event last year, so the Heard encourages guests to purchase theirs as soon as possible. To purchase tickets, visit www.heardmuseum.org.